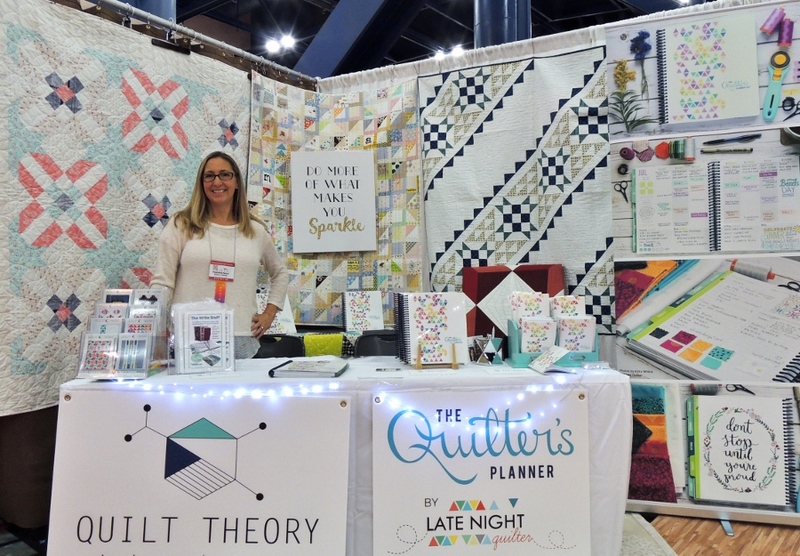 Although I was in Houston for a fairly extended period of time for Quilt Festival last week (Wednesday evening through early hours on Sunday), I spent most of my time in The Quilter’s Planner / Quilt Theory booth with Stephanie @Late Night Quilter, so my recap today is going to be about the booth experience and a few of the quilts I was able to dash to visit in the Modern Quilt Guild Showcase on display. In general, I had way more energy and enthusiasm than I had expected. Quilt people are generally very friendly, happy, fun people to interact with. Finding dinner each night was a challenge after a long day (9-7). It was easy to interact and be with the attendees, but after they left and we “closed” for the night, there was no mental power left to choose a place to eat! The soft squishy floor tile (that looks like wood) was awesome and a life saver. Being on our feet most of the time (5-10 Wed, 10-7 Th, Fr, Sa, and then 10-4 Su for Stephanie) it was so nice to have padding. Stephanie found it on Amazon and I think I might order some to stand on when I am quilting on my longarm. The booth was lovely, light, inviting, open, and modern. We received many very positive comments and compliments about the aesthetic of the booth. People who were NOT planner people would go out of their way to be nice about the setup. On the topic of lovely people, these three ladies are from Louisiana and made fast friends with my partner in Quilt Theory, Daisy @Ants to Sugar, when they heard Daisy was moving to their state. 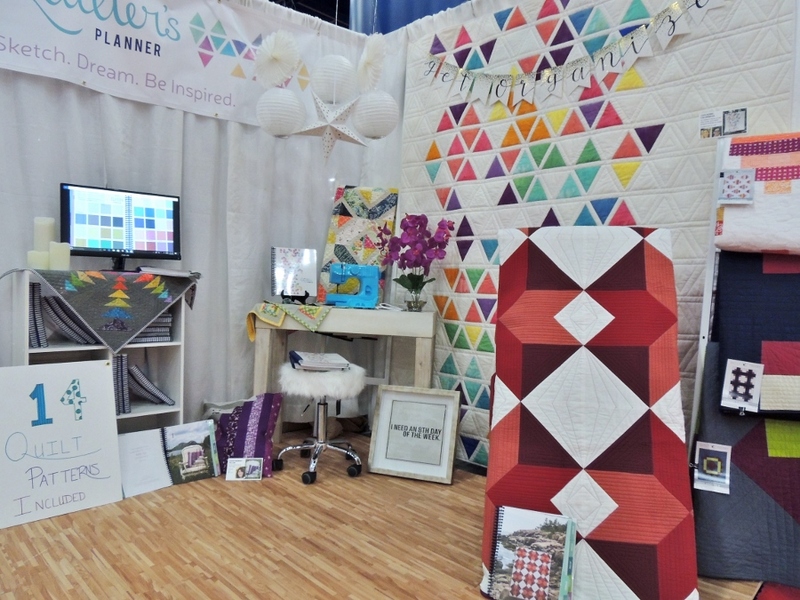 They went out of their way to welcome her to Louisiana, they came to see us and her pattern in the booth, and one of them is even headed to Sewtopia with Daisy this week. It made me so happy to hear of their kindness and generosity. On Thursday, I had on maybe 2 inch heels and Stephanie was wearing much more sensible flats in this photo, so don’t let that height difference fool you. My feet survived, mostly due to that awesome flooring in the booth. And back on the topic of lovely people, a quilter offered to photograph us together on the day we were all matchy-matchy and then came back to get us in some “action” shots the next day. We slowly made improvements to the booth over the days. 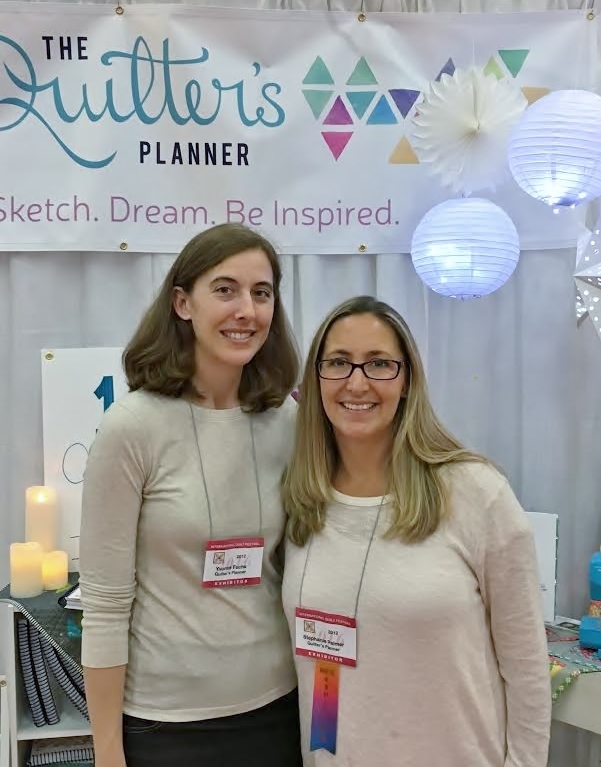 We clipped the pattern cards to the displayed Quilt Theory quilts, opened up planners to the pages where each of the quilts is featured within the planner (my quilt is on the September tab which is my birthday month! ), and got a video loop playing of the new awesome features in the 2017 planner. 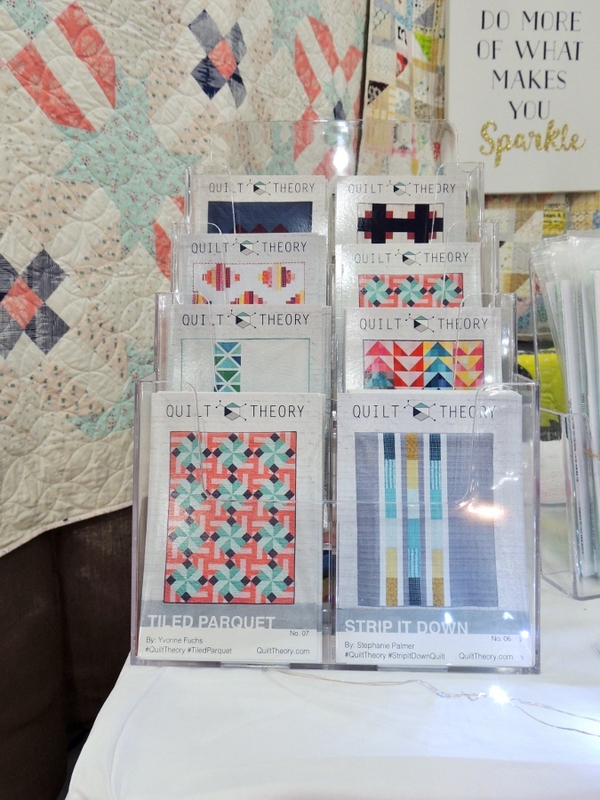 It was great to see and touch the Quilt Theory pattern cards, and watch how people would interact and stop in their tracks when they saw the patterns. I don’t know what it means, but they put the cards back in the correct slots if they placed them back, too. Saturday morning before Festival opened, Stephanie and I dashed over to see the Modern Quilt Guild Showcase on display, and I got a quick photo with my quilt Sunburst. They had a very odd method for keeping distance from quilts; that elastic wrap was really distracting when viewing longer hanging quilts. Saturday was also notably the day that I was in the feistiest mood. I boldy touched my quilt and was caught on camera making a crazy face in the booth. All in all it was a wonderful experience for me. I learned a lot about myself and got to spend time with fantastic people. I think I might need to catch up on sleep this week, though. Awesome booth! Thanks for sharing! So glad the two of you had fun, and you enjoyed yourself! as for your quilt… if you can’t touch it who can? lol! It was very lonesome around here last weekend. So glad I added that IG account! I hope your feet have recovered and Stephanie’s will soon, being on your feet that long everyday interacting with everyone must have bee interesting. From all the pictures the booth looked so beautiful. The booth really does look inviting and friendly. I’m so glad you enjoyed the weekend! Thanks for letting us in on a bit of the fun. I’ll get there sometime! The booth looks great. I attended market and festival two years ago. And yes, working a booth for each event is quite different. I’m glad you enjoyed it with Stephanie. You both look like you are having a blast. Thanks for the recap. I loved the look of the booth and how it was organized/laid out. It’s obvious that you both had a great time despite the long hours. If you find out, please share the flooring that was used. Good Morning Yvonne! It was fun reading your post and seeing all of the photos. 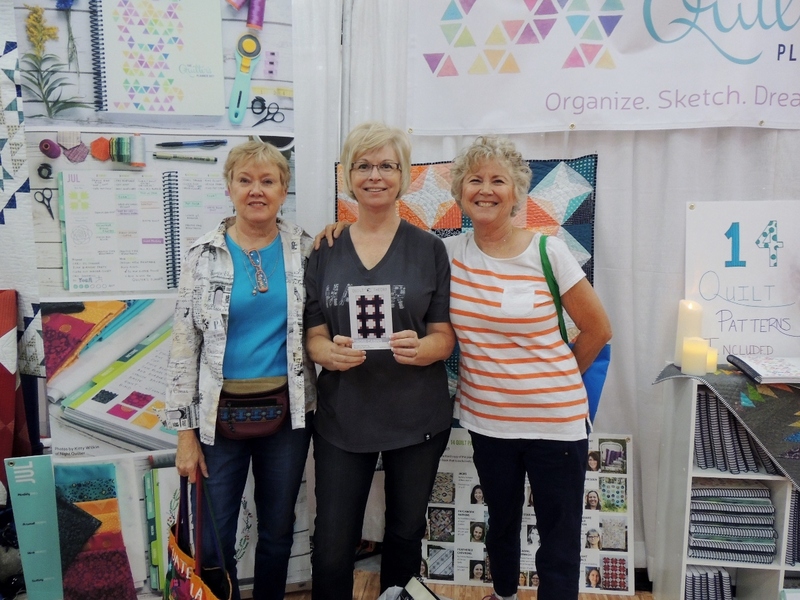 I am glad that you had a great time at quilt market again this year. 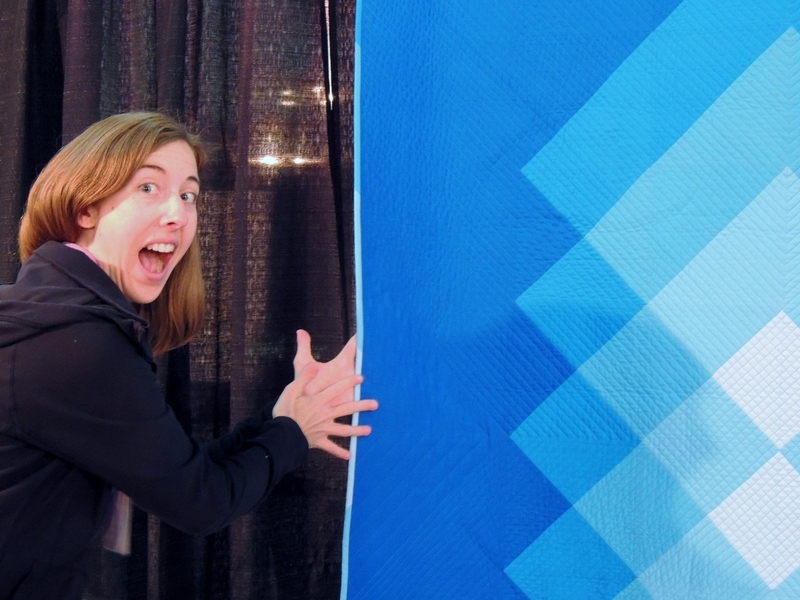 I especially enjoyed the photo of you being silly and touching your quilt….just a great way to have fun! Thank you for sharing your adventure. Now get the catch up sleep that you need and start planning for next years adventure. Have a fantastic creative day! 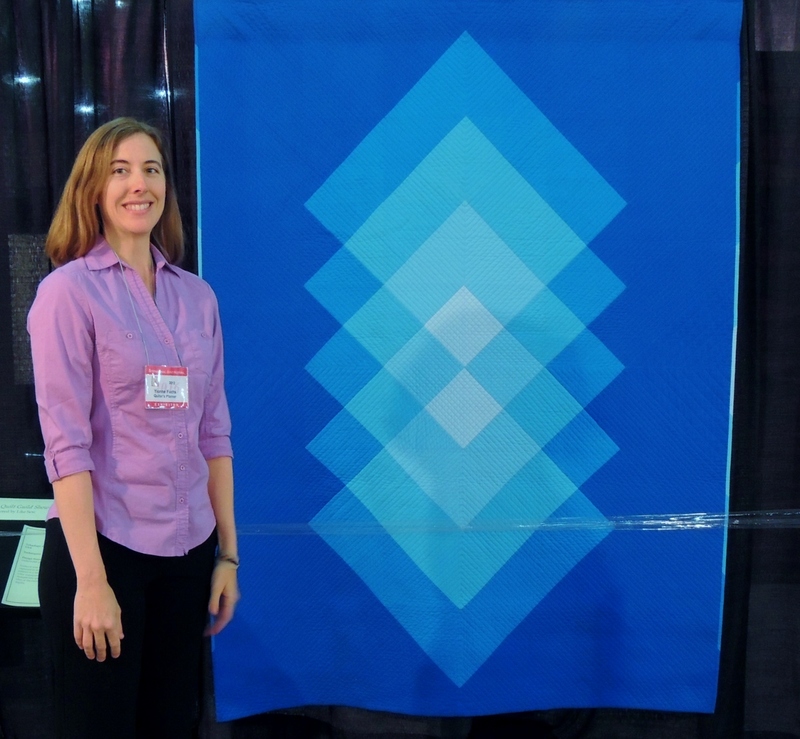 Thanks for sharing your experience at Quilt Festival. I’m sure your hard work will be rewarded! Yvonne, it was great to see you in Houston. I wanted to come back the next day but ended up leaving early to catch a visit with an old friend who was in my town for a few days. I’m so glad y’all did well – you have some lovely patterns there! I will keep in touch regarding the retreat idea, too. Your account was fun-; the booth was light, airy and inviting. Thank you for a great recap! I think you will need to catch up on sleep. You must have had tired feet after those long days standing. I did just one day in the shop last week and my ankles, although not sore, were ‘aware’ of the outing. Thanks for the recap – your booth looked great and it sounds like the whole experience was a lot of fun. Fantastic – delighted for you all and thanks for sharing the experience! You guys had a really lovely booth, and it was great to meet you both in person!